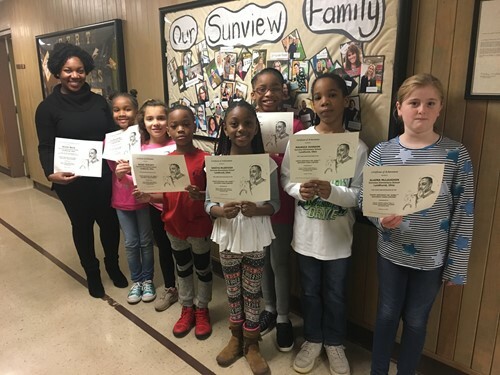 Sunview Elementary Students Honor Dr. Martin Luther King, Jr.
MAC Scholars at Sunview Elementary School recently received certificates of participation for their role in helping to keep the hopes and aspirations of the Reverend Dr. Martin Luther King, Jr. alive in our community. Sponsored by the Dr. Martin Luther King, Jr. Holiday Scholarship Committee, the writing contest in which our Sunview students participated included writing a commentary on the life and legacy of this Civil Rights cultural and social icon, performing research on Dr. King’s life and then creatively expressing the findings, and ultimately promoting lifelong learning. Our Sunview Elementary MAC Scholars are leaders in the building and identify places in our community where they can make a meaningful impact, such as with this Dr. Martin Luther King, Jr. Holiday Scholarship Committee contest. The SEL Schools thanks this group, along with advisor Annie Beck, for taking the time to involve themselves in the worthy cause of learning more about the life and teachings of Dr. Martin Luther King, Jr.